Park2Go has a state-of-the-art facility that offers you a whole new parking experience. They have friendly and courteous staff in uniforms, the latest technology through surveillance cameras, and a secure fence protecting the paved, lined, blacktop parking lot. 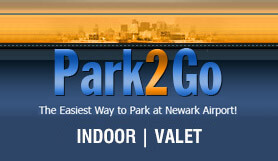 Park 2 Go - EWR provides safe and secure parking with same price for self park or valet. Park in the fully covered, indoor section of our facility for just a small additional cost. Have your car washed, detailed or have the oil changed while you are away. Only 3 blocks from Newark Airport - serving all terminals and ensuring immediate pick up upon return provided 24 hours per day on demand. Please take your confirmation details with you on your day of travel. Valets and mechanical services available to book on arrival. Park2Go do not accept Pickup Trucks. Park2Go do not accept reservations 3 days or less in duration. Please arrive at Park 2 Go Parking 15 minutes prior to the time you want to be at your airport terminal. Door to door shuttle. Fully enclosed indoor. Full return instructions will be given to you by Park 2 Go. Follow 1&9 North to the Bayway Circle Elizabeth. Stay on Route 1 & 9 North, proceed 2.2 miles to North Avenue and make a right on North Avenue. Go to the 1st traffic light (McDonald’s is on your left side). Park2 Go is behind the Seaport Diner entrance. It is .01 miles down on the right side at 780 Dowd Avenue. Follow signs to Route 1&9 North, you'll be on Bayway Avenue (which is Route 439 North). Follow approximately ½ mile to Route 1 & 9 North, travel 2.2 miles, and make a right on North Ave. Go to the 1st traffic light (Dowd Avenue) and make a right. You are on Dowd Avenue. Park2 Go is behind the Seaport Diner entrance. It is .01 miles down on the right side at 780 Dowd Avenue. Pay toll and go straight (Middle Road) on Dowd Avenue-North Avenue. Go approximately ½ mile to the light (McDonald’s is in front of you). Make a left at the light. You are on Dowd Avenue. Park2 Go is behind the Seaport Diner entrance. It is .01 miles down on the right side at 780 Dowd Avenue.